The new China Radar from COTRI for the 4th quarter 2018. Full view under this link. Hamburg (March 1, 2019). The number of border crossings from Mainland China increased in the last quarter of 2018 by 7%, but this growth only benefitted the destinations of "Greater China". The rest of the world saw a shrinking Chinese international outbound tourism market and welcomed for the first time in a last quarter of the year less Chinese visitors compared to the year before. 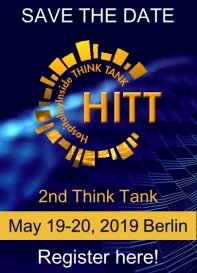 A new analytical tool has been set up by COTRI ANALYTICS and will be published quarterly on the front page of hospitalityInside.com. The new quarterly statistics published by COTRI ANALYTICS, a tool of Hamburg-based COTRI/China Outbound Tourism Research Institute, Germany show that 56% or 22.5 million of the 40 million outbound trips from Mainland China in the last quarter of 2018 ended already in Hong Kong, Macau or Taiwan. Only 44% or 17.5 million brought Chinese travellers to destinations further afield. In 2017 the ratio had still been 50:50 between Greater China trips and trips to the rest of the world, in the years before the balance used to be even in favour of longer travels. The last quarter includes the National Golden Week in October, one of the main travel seasons in China. Especially the Special Administrative Regions Hong Kong and Macau managed to add five million arrivals from China in the last quarter within the last two years, whereas the rest of the world lost one million arrivals in the same period. China is the world's biggest international tourism source market and for most destinations in East Asia and Oceania the No. 1 source market. For many countries in other parts of the world China represents the No. 1 Asian source market. Different destinations have been hit in different ways by the slump. Whereas many traditional destinations like Australia or Thailand saw little growth or even decline, others enjoyed growing arrival numbers and increasing market shares, especially Nepal, South Korea and Cambodia in Asia and many smaller destinations like Croatia, Serbia and Spain in Europe as well as Canada in North America. Germany, Austria and Switzerland all welcomed in the last quarter of 2018 almost exactly the same number of Chinese visitors as in the same period of time in the previous year. For the whole year 2018 Austria managed to achieve a YoY growth of 8% and Switzerland of 6%, but Germany could only get an increase YoY of just 2%. Chinese are still travelling abroad in growing numbers, but the lower end of the market has become a little bit more cautious, choosing rather destinations close by, including Hong Kong and Macau, whereas the upper end of the market is looking for more authentic experiences in new destinations. Simplified visa regulations, increased numbers of direct air connections and the new road and rail links between Hong Kong, Macau and China support this new travel pattern. Since the summer of 2018, the RMB has also lost some of its value against the USD and the Euro, another reason to stay away from the USA and from Europe. The last quarter of 2018 also witnessed the end of the EU-China Tourism Year 2018, which similar to most of such events did not have a major impact and could not prevent that Europe kept losing market share for the Chinese tourism source market. The biggest increases in arrivals in Europe were witnessed by non-EU countries like Bosnia & Herzegovina and Serbia, which offer visa-free entry for Chinese visitors. COTRI Analytics provides detailed statistical information for the 80 most important destinations of Chinese outbound travellers. For the fourth quarter 2018 it publishes for the first time the COTRI ANALYTICS RADAR, showing which countries outside of Greater China had the biggest increases or declines in market segments according to age, gender, purpose of visit, form of travel, accommodation used etc. and in market share. 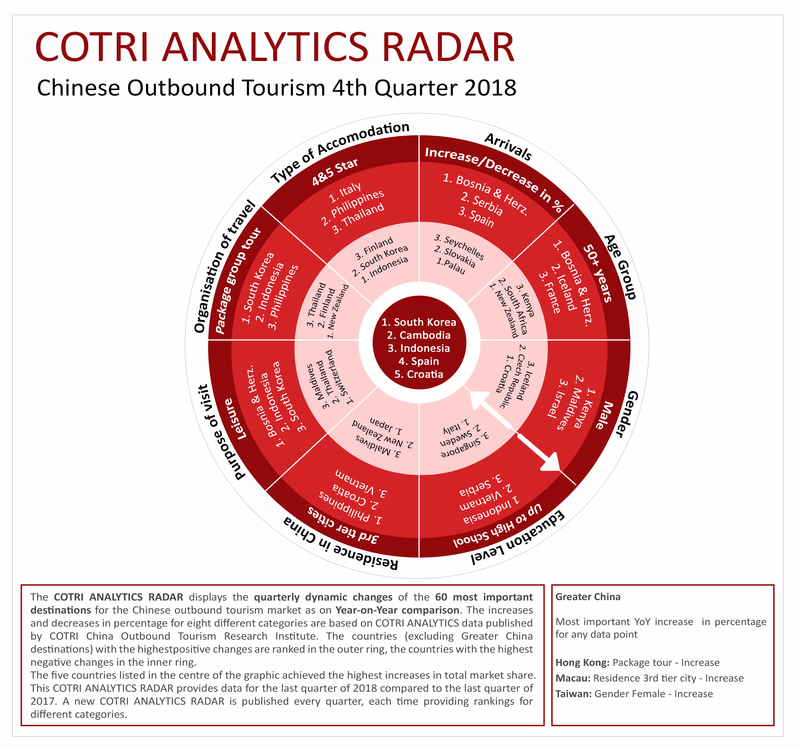 What makes COTRI Analytics Radar different from other available data sources for the Chinese outbound tourism market is the fact that it does not concentrate on the arrival numbers of destinations, as the Top 10 destinations already cover more than 70% of all outbound trips from Mainland China. It rather highlights the dynamics of which kind of Chinese travellers are currently discovering – or walking away from – which destinations. You can see the complete Radar in the attached PDF or under this link.